Prior to the party starting, take pictures of everything – bachelorette party decorations, food, signs, gifts and venue so the bride-to-be can see how cute everything was before the party started. The Bachelorette may be focused on the people and not realize how nice everything was until she looks at the pictures. Make sure you have plenty of memory (if using digital cameras) or film and extra batteries for the bachelorette party camera. If your camera has a timer or remote you can use it while posing for the picture. If not, see if one of your guests, neighbors or a helpful lad will snap the picture for you. It is important to get all the girls together for some group bachelorette party pictures. Make sure you have extra batteries and a spare flash card or two. Take as many bachelorette party pictures as you can, so you have a better chance of getting a good one. When taking a group bachelorette picture, have all the girls move in as close together as possible before taking the picture. The closer you can get to your subjects the better. So, either move closer to your subject or use the zoom. Try to take pictures of people at eye level. Also state this to others that you have take the group shots. Use of a tripod helps a lot, and keeps the camera steady. We know tripods are not advisable to take on away bachelorette parties since they are bulky and can be forgotten at your bachelorette destination. Position your bachelorettes so they are illuminated by the best light source in front of them, not behind them. Be sure to select the best white balance setting for your camera based on the light source. Back-lit bachelorettes and party goers don't come out very well and are difficult to see pictures. If you do use the flash, make sure you are within its effective range, typically between six to twelve feet, depending on your camera. 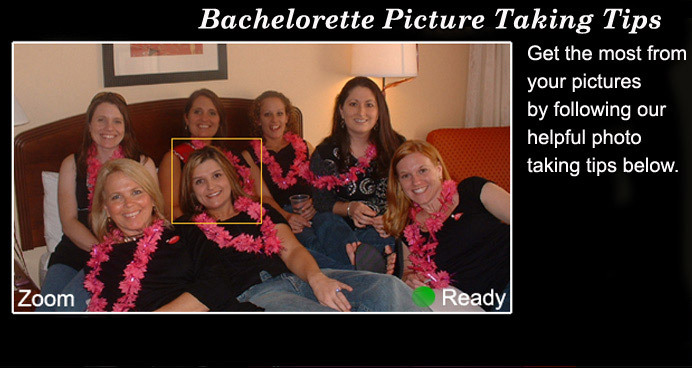 Make sure there is not a lot of background clutter before taking the bachelorette picture. All too many times there are objects that may distract from your sassy friends. Try to get in some of the bachelorette party decorations or bachelorette wearables the bride-to-be is wearing. Make sure you take many pictures of the Bride-To-Be from the moment she enters the party till being the last one standing (or passed out). Do not take any photos she will see as embarrassing as it is her moment and not a time to haze her. Take a photo of the bride-to-be at the door entering the bachelorette party - A great beginning shot. Every bachelorette party game is a great time for a photo. Take a picture with the bride-to-be’s and her friends each individually and in a group. Get a group picture with everyone present at the bachelorette party. Get some action photos of the bachelorette and her bridesmaids drinking and having fun. Always be ready to get a few of her laughing...You may have to be fast about this. Make sure to get a picture of the Bride-To-Be opening up all her wonderful and funny bachelorette party gifts. There are always a few gag gifts that are funny to catch with a picture. A cute picture is to have her at the end of the day take her shoes off and sit in a chair with her feet up fanning herself like she is ready to now get married (or go to sleep). Think about getting the bachelorette a bachelorette party photo album to house all the wonderful pictures. As I stated above, make sure to get the bachelorettes close together so everyone fits in group photos. Make sure you have a photo taken of everyone present that is present. It is fun later for the Bride-To-Be to see who was present at her last night out a few months or years later when she goes through her album. Don’t force bachelorettes if they don’t want to be in the pictures for some reason. We had a lawyer and celebrity who stated they would rather not be in pictures that involve drinking and we honored their wishes. As the bachelorette photographer. Be in as many pictures as you can since you may forget and take all the pictures with you in none of them which would be sad for the bride to be later on. I hope these bachelorette party picture tips are helpful. We would love to hear from you with other tips and ideas as well as if you want to send in your favorite bachelorette party photo that we may use on the site. 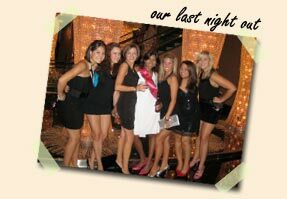 Have great bachelorette parties and email us at bachelorette@bacheloretteparties101.com.